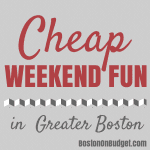 Cheap Weekend Fun in Boston for July 26-27, 2014! I can’t believe it is the last weekend of July! 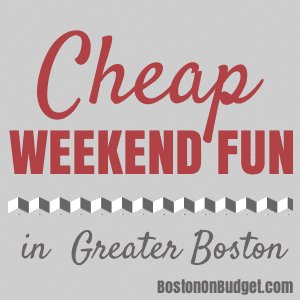 Here are some fun and inexpensive things to do in Boston this weekend! If you are looking for fun things to do this Friday 7/25/14, don’t forget to check out these Fun and Free Friday Events! Walhburgers on Wheels Free Food Truck: Saturday, July 26, 2014 from 11am to 7pm at Faneuil Hall. Look for the Walhburgers on Wheels Food Truck parked at Faneuil Hall on Saturday for a free burger and tator tots! Summer Arts Weekend: July 26-27, 2014 at Copley Square. Enjoy the weekend with great local and national acts in Copley Square. Free and open to the public. Figment Boston: Saturday, July 26, 2014 from 11am to 11pm and Sunday, July 27, 2014 from 11am to 6pm in Dewey Square. Enjoy this annual celebration of art and culture. Free. Cambridge Jazz Festival: Sunday, July 27, 2014 from 12-6pm at University Park Commons in Cambridge. Enjoy an afternoon of jazz from local and national musicians. Free. Magic Family Film Festival: Saturday, July 26, 2014 at the Prudential Center courtyard at dusk. Enjoy a free outdoor movie screening every Saturday night at dusk. This week’s free outdoor movie is Hoodwinked Too! Free Movie Nights at Christopher Columbus Park: Sunday, July 27, 2014 at Christopher Columbus Park at dusk. Enjoy a free outdoor movie at Christopher Columbus Park in the north end at dusk. This week’s free outdoor movie is My Neighbor Totoro! Out of the Park Event: Sunday, July 27, 2014 at 1:40pm at Boston Common. Cheer on the Red Sox on the big screen at Boston Common! Free. ICA: Saturday, July 26, 2014. The ICA is free for families (with children under 12) the last Saturday of every month, except December. Shakespeare on the Common: Performances daily through August 10, 2014. Head to Boston Common for Shakespeare on the Common with a free performance of Twelfth Night. Patriots Training Camp: Through July 27, 2014 at 9:15am each day with additional dates being added. Head down to Gillette Stadium this weekend to check out the 2014-2015 New England Patriots! Free and free parking. Also, don’t forget to check out Free Fitness Classes & Events in Boston and Discounts for Water Country for some fun summer savings as well as 27 Free Things to Do in Boston this Summer. Please let me know in the comments if I missed any fun and free events for this weekend! Hope you have a great weekend!